How can we harness the power of humanity to understand and address changing risks? 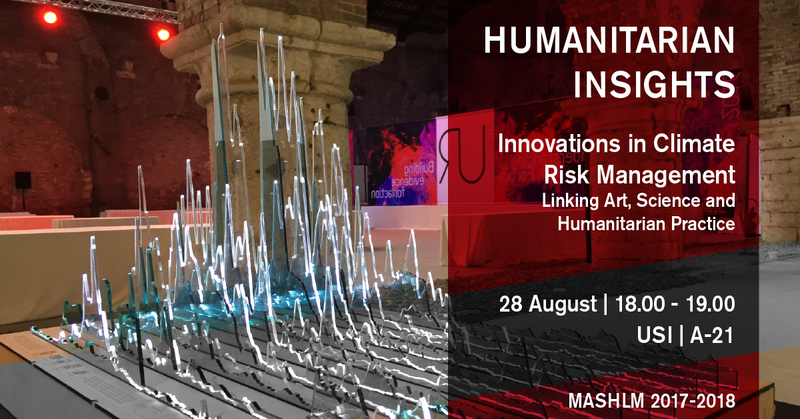 In this intensely interactive session, we will explore the powerful opportunities offered by integrating creativity and innovation into risk management. Focusing on disasters, climate and development issues, we will share recent initiatives ranging from DataSculptures to illustrate the use of machine learning in flood risk management in Togo, to Virtual Reality for explaining how to set up forecast-based financing to trigger early action. We will enjoy the serious fun of games that help people and organizations experience the complexity of future risks and tough decisions – with examples from rural Kenya to global insurance markets and from the World Bank to the White House. Importantly, we will jointly brainstorm how researchers, artists and designers can work with you, the University of Lugano, humanitarian and development organizations and other stakeholders to confront evolving hazards and vulnerabilities - mobilizing both the intellect and the emotions of decision makers at all scales. Pablo Suarez is Associate Director for Research and Innovation at the Red Cross Red Crescent Climate Centre, as well as visiting fellow at Boston University, honorary senior lecturer at University College London, and faculty member at Università della Svizzera italiana’s master of advanced studies in humanitarian logistics and management. He has consulted for the UN Development Programme, the World Food Programme, the World Bank, Oxfam America, and about twenty other international humanitarian and development organizations, working in more than 60 countries. His current work addresses institutional integration across disciplines and geographic scales, and the use of innovative tools for climate risk management – ranging from financial instruments for faster disaster preparedness, to self-learning algorithms for flood prediction, to collaboration with artists and designers to inspire thinking and action. Pablo is artist in residence at the National University of Singapore (NUS-LRFI). He holds a water engineering degree, a master’s in planning, and a Ph.D. in geography. The event is open to the public and will be live-streamed through Facebook. Send us an email or join the event on Facebook to receive the link, which will be available at the beginning of the seminar.